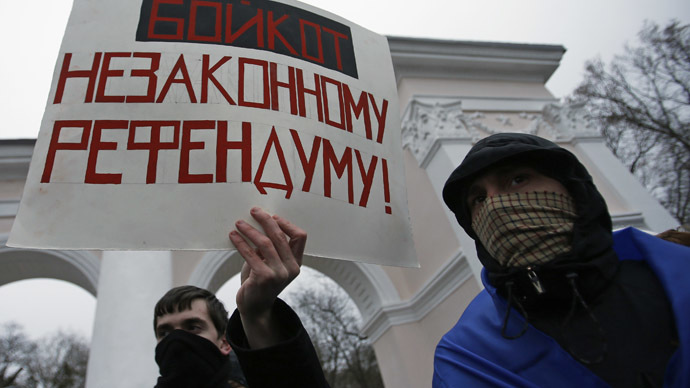 With Crimea’s region breakaway referendum nearing, local authorities report an upsurge in provocations by pro-Maidan activists. In the Crimean capital of Simferopol an undisclosed number of people have been detained for purposefully damaging civilians’ passports or taking away their documents, local police reported Tuesday. Under the guise of policemen, a group of perpetrators asked people in the streets of the city to show their passports, which is a normal practice in CIS states. They then either kept the documents or ripped them up. The same fraud has been also reported in the small town of Saky (Saki) in western Crimea. People without passports will not be able to register and receive ballots for the voting in an upcoming referendum on the region’s future. Following the incidents, local law enforcements have called on Crimeans to be careful and not to show their passport to suspicious-looking people. A source in Crimean self-defense units told RIA Novosti that 60 to 70 activists traveling in 30 cars demanded to enter Crimea on Monday. 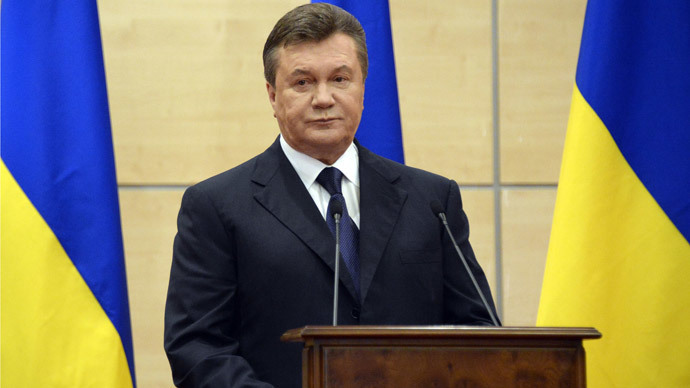 They reportedly said they planned to organize a Euro-Maidan protest, a rally similar to the one in capital Kiev, which gathered after President Yanukovich refused to sign an association agreement with the EU. 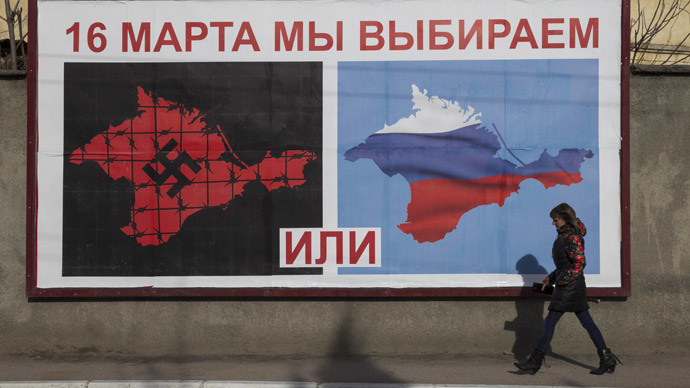 Earlier Monday a source in the Ukrainian Security Service told RIA Novosti that there was information that radical groups plan provocations on Crimea’s administrative border on the day of the referendum. 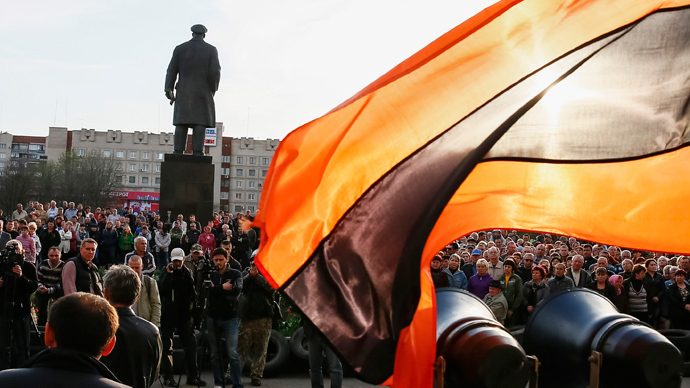 On Sunday, during a peaceful rally in Sevastopol to mark the 200th anniversary of the birth of Ukrainian poet Taras Shevchenko, a group of people from various regions of Ukraine started shouting Nazi slogans and calling upon people not to vote in the referendum, local self-defense squads reported. This fact was confirmed to Itar-Tass by local deputy Ivan Komelov. As a result, about 20 troublemakers were detained by self-defense squads and handed over to local police. According to Itar-Tass sources in law enforcement, there were members of ultra-nationalist Right Sector group among the detained. Two of those whom the self-defense squads were trying to detain – a man and a woman – opened fire at them, Komelov said. He added that though the squad members had no arms, they managed to detain both. A criminal case was opened against those two people on charges of attempted murder. A gun and a knife were found on them. According to Komelov, both said they came from Kiev. 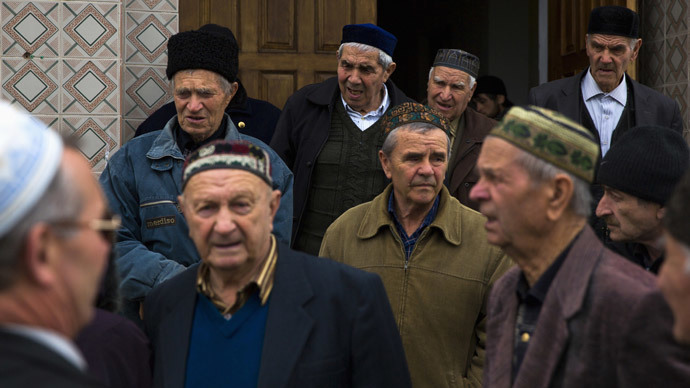 On March 16 Crimean residents – about 60 percent of whom are ethnic Russians – will cast ballots to decide whether the region will become part of Russia, or stay part of Ukraine with broader autonomy rights. On Tuesday, Crimea’s parliament adopted a declaration of independence from Ukraine, citing a similar situation to one in Kosovo. “We, the members of the parliament of the Autonomous Republic of Crimea and the Sevastopol City Council, with regard to the charter of the United Nations and a whole range of other international documents and taking into consideration the confirmation of the status of Kosovo by the United Nations International Court of Justice on July, 22, 2010, which says that unilateral declaration of independence by a part of the country doesn’t violate any international norms, make this decision,” the text of the declaration said. The declaration of independence was adopted during an extraordinary session of parliament with 78 of 100 members of the parliament voting in favor. Crimean parliamentary leaders believe that the situation in Kosovo set a precedent in international law, showing that there is no need for a central government to approve the holding of a referendum on a region’s independence and self-determination. Kosovo’s independence was acknowledged by 108 countries, including the US, France, the UK and Germany. However, his statement contradicts Ukraine’s position on Kosovo, which he voiced in 2007 while serving as Ukraine’s foreign minister. Visiting Pristina, the capital of Kosovo, at the time, Yatsenyuk said: “Officials in Kiev support the granting of independence to Kosovo. The Kosovo problem is very complicated, but, in any case, the final decision is full sovereignty,” he said. However, for his country now, Yatsenyuk rules out such a possibility and is vowing to fight for Ukraine’s unity. Russia, meanwhile, said the Crimean parliament’s decision to adopt an independence declaration from Ukraine is absolutely legitimate. The Foreign Ministry has said in a statement that Russia will respect the results of the referendum.